Should we get rid of job fairs once and for all? I've been to job fairs in Canada, France and Israel but the Techeads Israeli Hitech Job Fair on March 6th 2012 was the first job fair I'd been to in a while. I had originally planned to go to a recruiting event at the same conference center, just in a different room. When that was canceled, I ended up spending almost the whole day at the job fair instead. And I'm glad I did. After meeting almost all the company reps at the fair and speaking to well over a dozen attendees, here are some thoughts on that job fair and other job fairs in general. 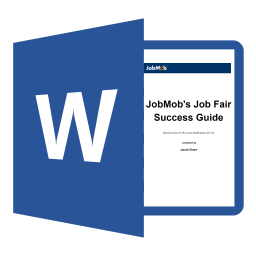 Free bonus: Download JobMob's Job Fair Success Guide with over 60 job fair tips. 1) What's in a term? Is it a job fair or a career fair or an employment fair? They're all the same. Local culture will decide which one sounds normal to you. If it's a student/college/university job fair, or just an internship fair, it's pretty clear who the fair is for- students and graduates. Otherwise they're usually open to everyone, but why is it that there are no fairs aimed specifically at older/experienced job seekers? At large fairs, you almost have to make an effort to not be productive. So many company stands, so many people milling around for you to network with. If you put in the time, your biggest worry should be not getting to see everyone that can help you. Small fairs are higher risk. You might waste time by going, but at least it won't be a lot of time. I remember going to a small job fair in Montreal at a motel. I was in and out in less than 10 minutes, and even if I had tried to meet all six companies that were there, I still wouldn't have been there for more than 30 minutes. However, the small fairs are usually the very local ones and can be a good place to find a local job. Which is why some people think they're an UTTER waste of time. Size is not the only differentiator. Some fairs are organized by professionals who structure the event to satisfy as many people as possible, and not just the event's clients, the companies who paid to be there. There will be media coverage, a dedicated website, registration confirmation emails and more. Other fairs are non-regular events created to respond to public demand (perceived or real), e.g. hosted in a church or community center. They won't attract the same kind of companies or attendees as the more publicized fairs, so keep your expectations in check. While it is true that the hiring companies are the paying clients of the fair, without the non-paying job seekers, there would be no fair. Fair organizers need to do more to respect attendees so that they are less likely to leave unsatisfied and never visit another job fair again. That includes navigating job seekers to the most relevant stands, giving them the tools for success (e.g. pens to submit application forms, option to print/photocopy resumes, etc.) and getting their feedback on how to make the next fair better. Even just making the fair more upbeat would be a good thing. This used to be me. I traveled 75 minutes from Jerusalem to a Tel Aviv job fair only to waste 30 minutes there before spending another 75 minutes getting home. At Techeads, I asked most company reps if anyone had impressed them that day, or even just been memorable. Almost all of them replied in the negative. That's just wrong. Know your job fair success do’s and don’ts before you go. Because fair organizers usually don't do enough to lead job seekers to company stands, the companies try all sorts of tricks to get you in their line. Arguably most common- bowls of candy. At the Techeads fair, every stand had a different bowl of candy. That's a lot of candy. It was basically a candy fair. I could almost imagine a company rep setting up their stand and pulling their hair out when they notice that a competitor had the same candy. I also wouldn't be surprised if anything left the fair not feeling well because they ate too much candy. There are only so many pens one person can take home. Luckily, some companies are more creative than that. At Techeads, one company gave out fluorescent back-scratchers, a handy desk accessory (pun intended). Google is also famous for giving out cool little gadgets and magnets. At the end of they day though, unless the giveaway is really special, it's a sideshow to the real reason people line up at a job fair stand. One company at the Techeads fair had a very long line of job seekers waiting to speak to the company reps. The line was so long at one point that almost half the attendees in the room were in that line. So I decided to survey some of them to see why they didn't visit the other stands and come back when the line was shorter. Everywhere I looked, there were QR codes at Techeads. On posters, on flyers, on business cards, even on a job seeker's t-shirt (I regret not having gotten a picture of that). But everywhere I looked, I didn't see attendees using their smartphones to decode the QR codes and visit the embedded websites. People don't come to job fairs expecting to spend money unless it's to buy lunch or to pay for a ride there. Regardless, there will usually be at least one fair sponsor trying to sell newspaper or magazine subscriptions, or books, or Internet access, or cellphone packages, and those stands seem to be the least active at fairs. Depends on the hours of the fair relative to the local work culture but in general, it's towards the END of the fair. In Israel, people like to get up early. As a result, Techeads was busiest in the morning and so quiet in the early afternoon that they closed the fair an hour early, at 3pm instead of at 4pm. However, anyone who attended from 2pm – 3pm had easy access to any company they wanted, and company reps are more likely to remember someone met at the end of the day than at the beginning. And it's not like positions are going to be filled earlier during the fair anyway, so by coming later, you would still be able to get in your resume for a targeted position. The common complaint about job fairs is that they're a waste of time. And for many people there, attendees AND company reps, they are. On the one hand, most of the job seekers line up to apply at a company stand, maybe ask/answer a question and then shuffle off to another stand, until they ultimately leave. On the other hand are company reps, there to do a job of taking in resumes, maybe ask/answer a question until the job seeker shuffles off to another stand. Not enough job seekers trying to really take advantage of the fair, and frankly, not enough companies making an effort to impress candidates into following up after the fair. JobMob's Job Fair Success Guide explains why you should go to the fair with over 60 tips. Subscribe to JobMob via RSS or email and follow me on Twitter for more insight on classic job search tactics. You’re right about being selective with Job Fairs. One should check which companies are attending and it should be used purely for networking purposes (i.e. getting to know someone at a company you specifically want to work for). I personally wouldn’t even bother leaving my resume behind at these things. So true. 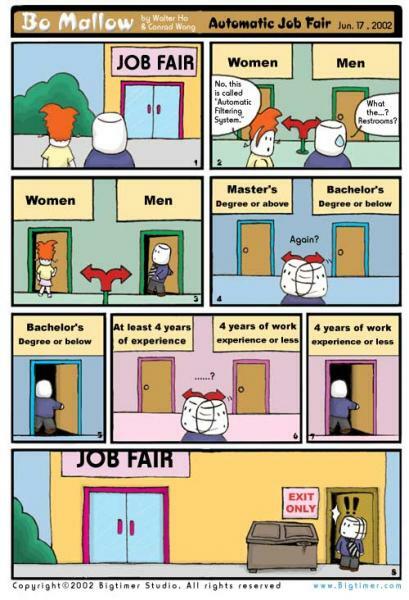 Too bad that both job-seekers and companies feel job fairs doesn’t work for them. BTW, is there a calendar for job fairs? it always feel so one-timer..
Haim- here’s a calendar for US job fairs, which country are you asking about? Thanks. This is the kind of thing I was looking for, although they don’t made it clear out front to which industry the job fair is targeted. You need to digg in for that… i’m from the Tech industry.